Volkl Kenja Skis - Women's: The Kenja is the slimmer, a little more piste-oriented version of the Aura. It features a 90mm waist, moderate taper in the tip, and the added maneuverability of tip and tail rocker. 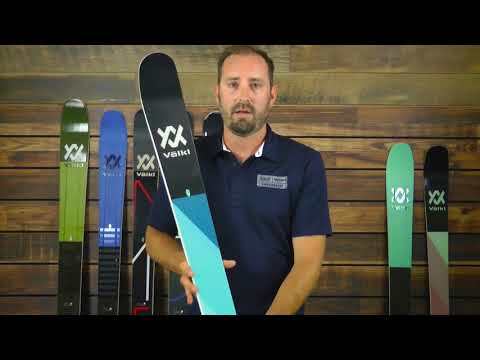 These design elements create easier, more playful handling, while maintaining the edge grip, stability, and frontside performance that have made it one of the most popular all mountain skis on the market. The Kenja doesn’t require aggression, but it rewards it. Most women back off the gas pedal when they transition into cut-up off-trail conditions, but they only way to subdue irascible old snow is to motor through it. If your skis don’t have the guts to resist the resulting vibration, you’ll be compelled to curb your ambitions. You’ll never have to hold back on a Kenja. The Kenja is the slimmer, a little more piste-oriented version of the Aura.